That’s not a coffee table, that’s a PC you can put on a coffee table for family games. It's a niche product, but Windows 10 offers more possibilities. Lenovo’s 27-inch Yoga Home 900, announced Monday, is built for the great American suburbs. For the family with a decently sized house and yards of counter space, this all-in-one PC could stand in the kitchen or family room for homework time. After dinner, it could flip onto the coffee table for games or creative projects. The $1500 starting price is on the high side, but it’s a versatile PC form factor—assuming you have the space for it. 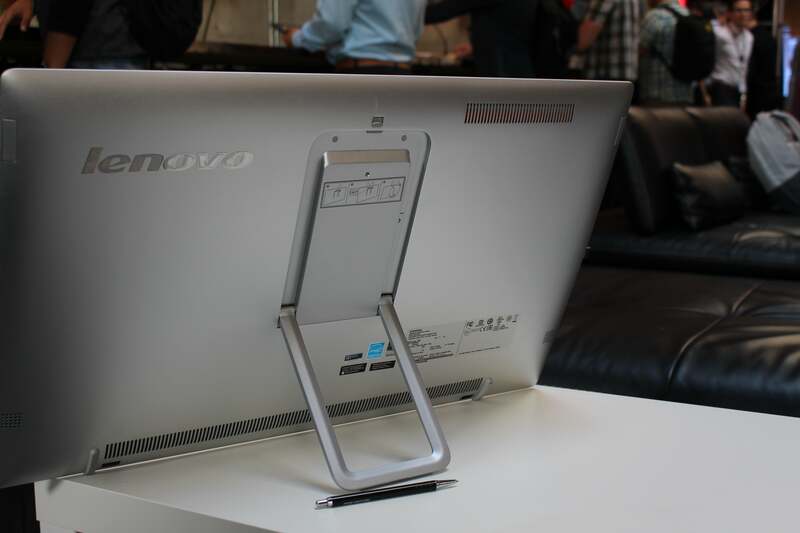 Lenovo’s the only PC vendor to have committed to a PC this large—its competitors have maxed out at 20 inches. The Yoga Home 900 improves upon the extra-large Lenovos of the past with some new hardware and, nicest of all, a lighter carrying weight. Yes, theoretically you can carry this thing from room to room. The Yoga Home 900’s 16.75-pound bulk is still heavy, but easier than the nearly 19-pound burden of yore. It still lasts about 3 hours on a 6-cell, 73Wh battery. 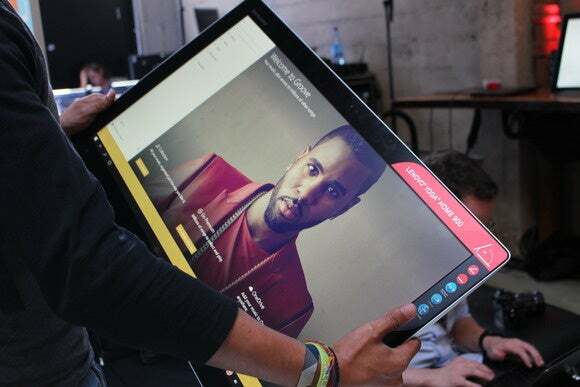 The Lenovo Yoga Home 900 has a 27-inch diagonal display with a resolution of 1920x1080 pixels. Inside the Yoga Home 900 you’ll find Broadwell-class CPU power, specifically the 5th-generation Core i5-5200U. Why not Skylake? 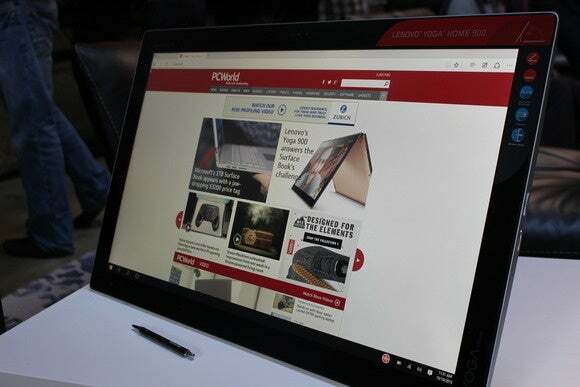 Lenovo didn’t explain, but we suspect Broadwell was easier to obtain than the very new Skylake, and besides, the Yoga Home 900 has other priorities besides speed. An Nvidia GT940 with 2GB of RAM will drive the 1920x1080-pixel LED touchscreen, and the PC will enjoy 8GB of DDR3L RAM plus 256GB of SSD storage. In this rear view of the Lenovo Yoga Home 900, you can see how the kickstand works. This PC is designed for play even more than work, so it comes ready with Lenovo’s own AURA interface, offering access to games, projects, and accessories, plus a selection of Windows Store apps tailored for this huge screen. The unit itself has three USB 3.0 ports, a combo headphone/mic jack, Bluetooth and Wi-Fi, and most distinctively, an HDMI-in for routing a TV signal to the display. You also get dual 2.5W speakers. The Lenovo Yoga Home 900's kickstand folds into the back of the display and fastens with a small latch. 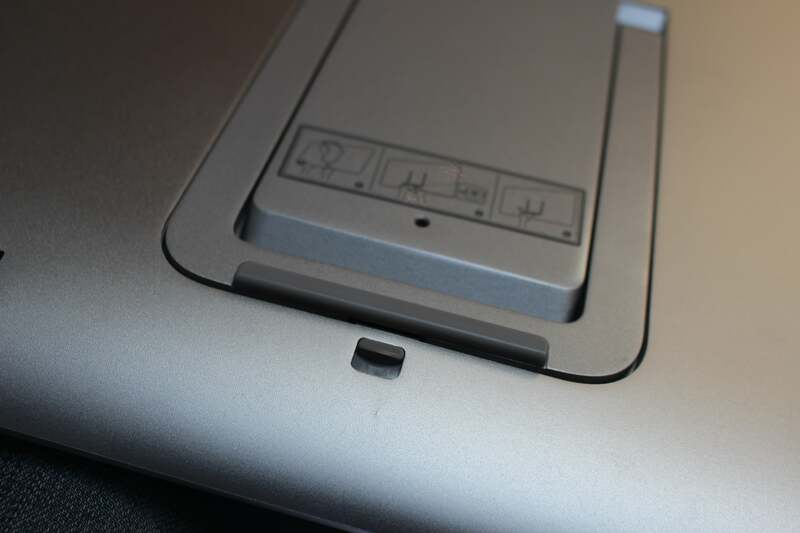 The Yoga Home 900 will be available at the end of October from Best Buy (for $1500) and Lenovo.com (for $1549). Why this matters: The Yoga Home 900 is still a niche PC, but Lenovo deserves credit for pushing hardest at the envelope of what a PC could be. Playing air hockey and other games on this PC’s predecessors was already fun. With Windows 10, the possibilities should expand.